We're all looking for functionality when it comes to styling, and this casual pairing of a light blue blazer and a Will Leather Goods Distressed Leather Work Belt Brown is a practical illustration of that. 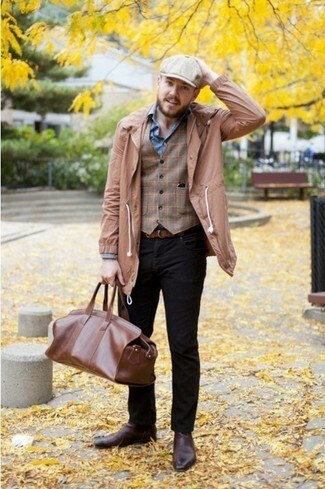 Tap into some Ryan Gosling stylishness and class up your outfit with a pair of tan leather oxford shoes. This street style combo of a brown houndstooth blazer and a brown leather belt is very versatile and really up for whatever the day throws at you. 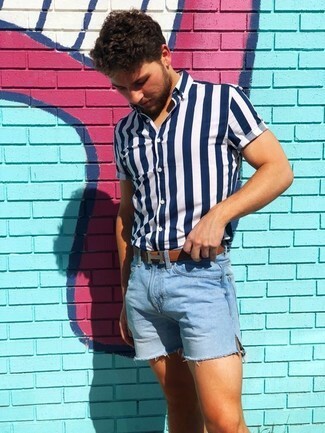 This pairing of a white and blue vertical striped short sleeve shirt and a brown leather belt offers comfort and practicality and helps keep it low profile yet trendy. We all seek comfort when it comes to dressing up, and this combination of a navy shawl cardigan and a Will Leather Goods distressed leather work belt brown is a perfect example of that. If you're searching for a relaxed casual yet seriously stylish ensemble, choose a navy shawl cardigan and a Will Leather Goods brown leather belt. 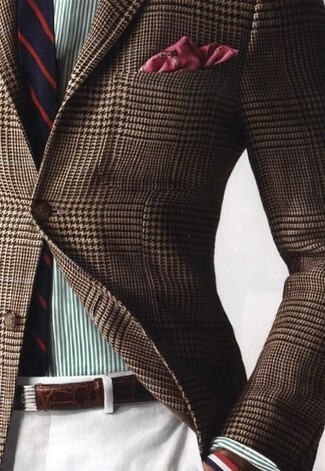 Make a navy duffle coat and a brown leather belt your outfit choice for comfort dressing from head to toe. 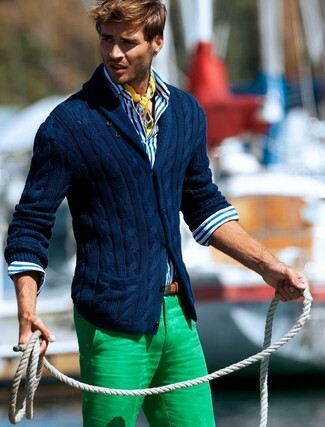 Sporting a pair of navy and green plaid suede loafers is a simple way to add some flair to your getup. The formula for a knockout off-duty outfit? A navy long sleeve shirt with a brown leather belt. 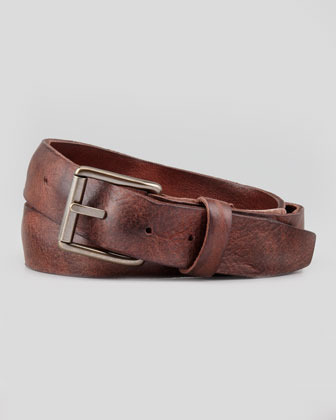 We're all outfiting for comfort when it comes to dressing up, and this combination of a navy blazer and a Will Leather Goods distressed leather work belt brown is a wonderful example of that. Got bored with this getup? Enter brown leather oxford shoes to spice things up. For a comfortable-as-your-couch outfit, try teaming a tan trenchcoat with a Will Leather Goods distressed leather work belt brown. Kick up the cool of your look by wearing brown leather chelsea boots.